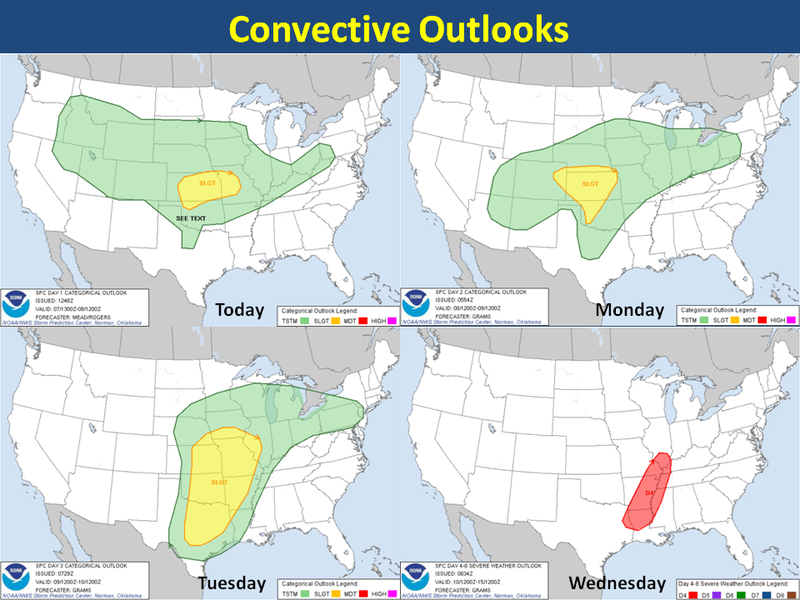 As a highly amplified upper-level trough moves slowly eastward over the next few days the severe weather threat will increase over the Plains starting today and into the Mississippi Valley by mid week. Sunday: Isolated strong to severe storms will be possible in the slight risk box. Hail to the size of baseballs, 60-70 MPH wind gust and isolated tornadoes are possible. 4:00 PM to Midnight time frame. Monday: Isolated severe storms will be possible in the slight risk box. Hail to the size of baseballs, 70-80 MPH wind gust and tornadoes are possible. 5:00 PM to Midnight time frame. Tuesday: Scattered severe storms will be possible in the slight risk box. Hail to the size of baseballs, 60-80 MPH wind gust and a few tornadoes are possible. 1:00 PM through the overnight hours. Wednesday: Scattered severe storms will be possible in the red outlined box. Large hail, damaging winds and tornadoes are possible. The severe weather forecast is based on the latest model guidance and is subject to change in later outlooks. Keep up with your local news/weather media and the National Weather Service for the latest on the severe weather threat.